Photo Polymer for use in Asiga 3D printing systems with the 405nm wavelength emitter. 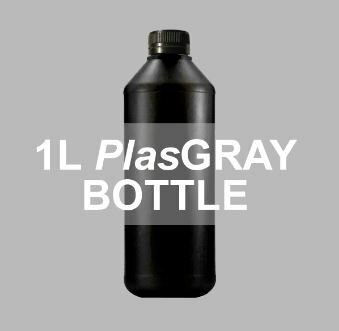 With strong PP/ABS-like properties, PlasGRAY is a gray colored material with great durability. It can be directly molded in RTV or low-temperature vulcanized rubber. If making vulcanized molds, you must dip the RP parts in our React-Shun nanoparticle release material so that it is easily removed from the cut mold. Because of the properties of the low temperature silicone rubber materials, it's not a bad idea to coat the mold frames and plates with React-Shun as well.